LightKulkture.com, a leading online retailer of contemporary LED Lighting, is pleased to offer new LED gift ideas for Dads and Grads. "The illuminated touch-sensor dimming control, conveniently located on the top of the flat panel shade, makes it so easy to use". Lightkulture.com is excited to offer Quattro, the new premium standard in LED flat panel technology in portable lighting, designed by Robert Sonneman and Peter Polick for the Sonneman A Way Of Light brand. “The high tech, glare free light output, using advanced flat panel LED technology, provides more focused light on what you want to see,” notes Susan Inderbinen President of LightKulture.com. As a task lamp, Quattro’s efficient, usable surface brightness is measured in terms of lux/lumen output. High Lux from lower lumens equals more usable, and less wasted light. Along with design innovation, Quattro is also remarkeably energy efficeint, producing 25% more Lux from 25% less power than conventional LED task lamps. Quattro is poised to the perfection of pure geometry and mechanical innovation. The three light levels, high 100%, mid range 60% and low level at 20%, features 3000K warm white color temperature to maximize the comfort and usefulness of the light at each level. The illuminated touch-sensor dimming control, conveniently located on top of the flat panel shade, makes it so easy to use. Quattro’s perfectly square base supports an ingeniously designed articulating rectangular arm, which easily glides through a range of motion to direct the light in the areas it’s needed most. The patented internal compression and tension mechanics, means there are no visible external supporting springs or exposed components. The arm rotates 90 degrees on a pivot, inset flush at the corner of the base. The compact 3.5” square, ½ “ thin shade adjusts on two axes. Quattro sets a new standard, bringing superior technology to design excellence. Included is a 6 watt flat panel LED, 3000K, 85 CRI and 900 Lux. With a 28.5” arm extension, Quattro can reach the lighting sweetspot on a desk, next to a bed, or along side a sofa. The lamp is available in Bright Satin Aluminum, Gloss White, Black, or the iconic colorful combination of a red shade, black arm and yellow base. 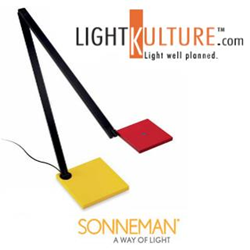 For more information go to Sonneman Lighting - https://www.lightkulture.com/brands/Sonneman.html. “My staff and I travel to markets all over the world looking for innovation, originality, technology and style. We found that all in one product, the Quattro LED desk lamp from Robert Sonneman and Peter Polick. Very often our clients are asking for better quality lighting for reading, writing, doing work at their desks, or reading in bed. This desk lamp has the most fluid movement, longest reach, with a convenient illuminated touch dimmer switch right on the shade. These attributes combined makes Quattro so easy, convenient and fun to use. A Quattro LED desk lamp is an investment in proper illumination that comes in a very stylish design. Quattro is my 2014 best product choice, an especially thoughtful Father’s Day gift, or for the graduate in your life. Quattro comes in black, gloss white and aluminum. However, my favorite finish is the combination of red, black and yellow. This mix of color dates back to the Dutch art and design movement from 1917. For over a decade, iconic furniture and paintings of the day featured these bold color combinations. They are still trend-right, almost 100 years later. This lamp makes a great gift, even if for yourself,” noted Susan.